For people who love to go hiking, camping, or hunting, a good and reliable flashlight is a very important gadget. You are going to need it to be able to go around or get things done at night. As an outdoor enthusiast myself, I always make sure that I have a flashlight or two in my sturdy backpack. Through the recommendation of a frequent travel buddy, I purchased the BlackShark 5-watt LED flashlight. I had my doubts when I first got it but after using it for a while, I have to say that I'm very impressed. The flashlight is of very good quality. Additionally, it's sturdy because it's manufactured using tough materials. First of all, the BlackShark 5-watt LED flashlight gives off a swath of light that can illuminate a wide area. When using it, it felt like I had a miniature flood light in my hands. The flashlight can also be adjusted so that you can focus it on a smaller area or have it flood a wider area. This is why I often have it with me whenever I go camping or hunting. It's lightweight and small so I can easily stick it in a pocket in my backpack or even carry it wedged in my belt. In fact, the flashlight has a stainless steel pocket clip for convenience. 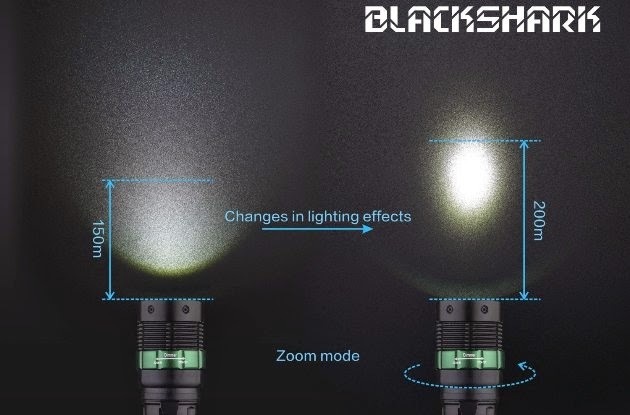 Aside from the good quality light that it produces, the BlackShark 5-watt LED flashlight is also durable. It's been designed to withstand pressure and water. I was really surprised when I had it submerged underwater during a recent hiking trip only to find out that the water didn't seep through the body of the flashlight. That said, it can really last for a long time. And last but not the least, I like the flashlight's 3-modes feature. The flashlight can be adjusted to gain access to low, high, and SOS lights. In short, it's the perfect flashlight for people who love the outdoors like me.